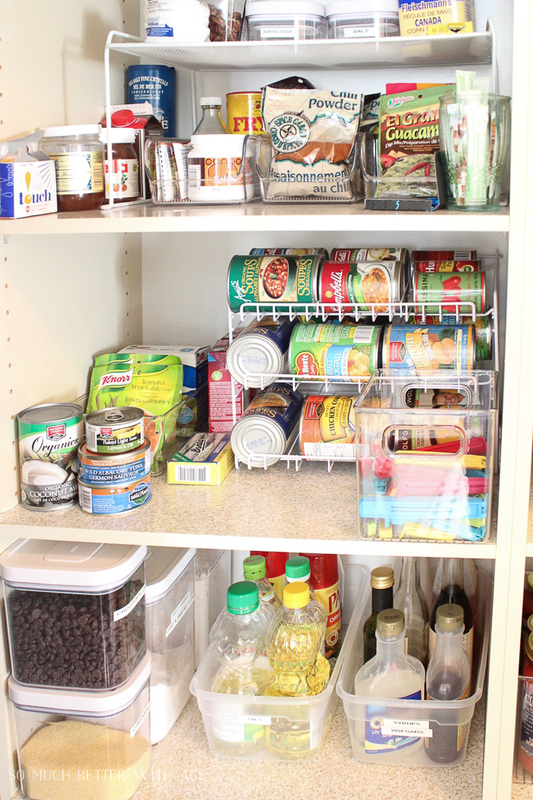 I organized my pantry and found so many different ways of organizing all the different items. 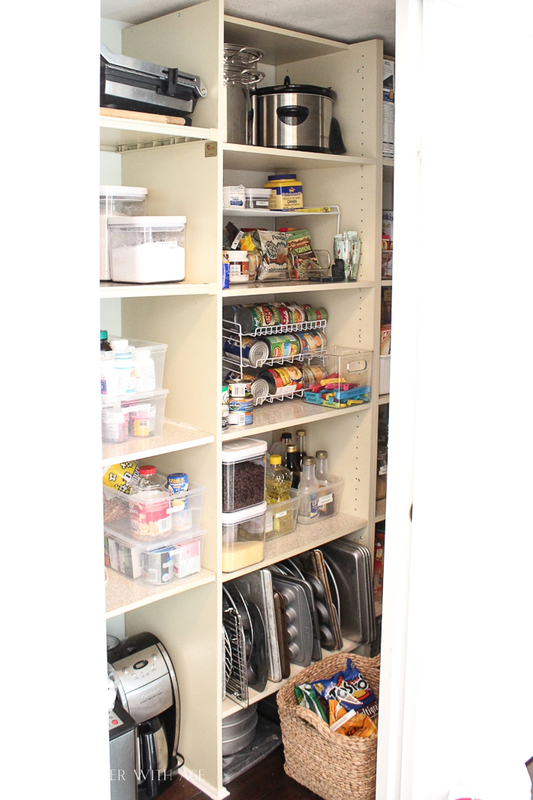 Let me show you how I organized my pantry just off my kitchen with lots of different storage ideas and tips! 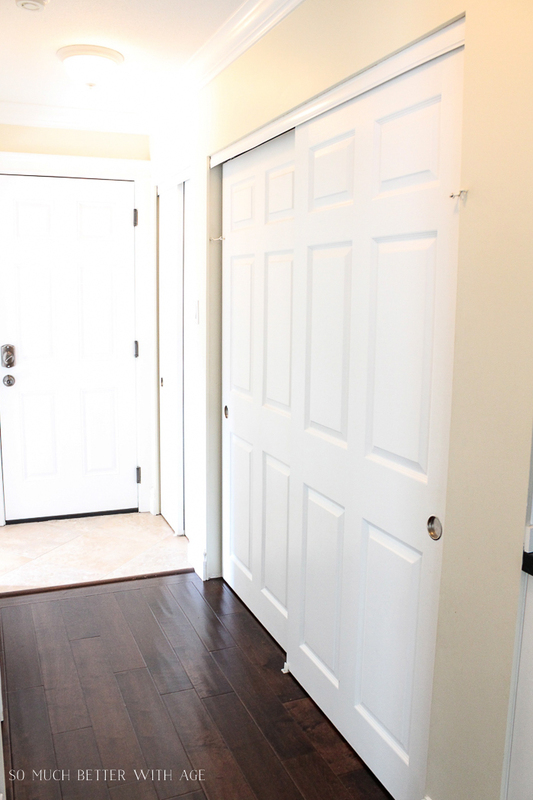 Just off my kitchen there’s a long hallway that leads to the garage door and laundry room. 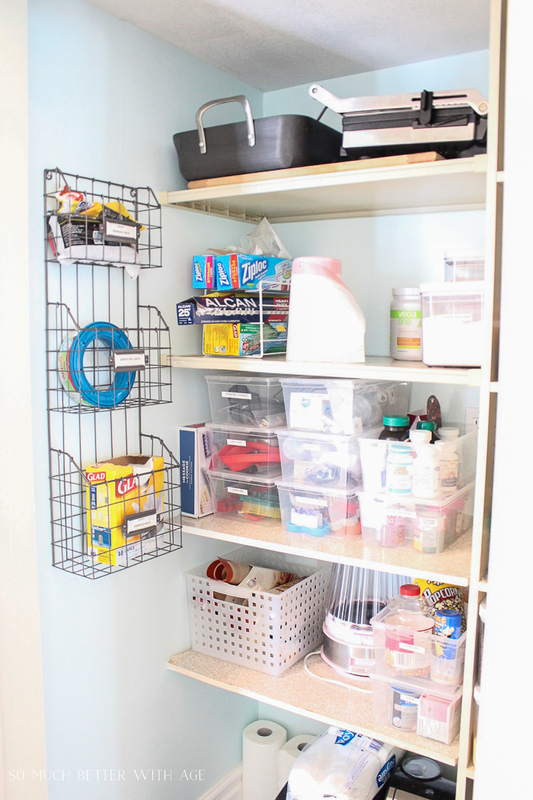 My kitchen doesn’t have enough space for an actual pantry so I utilized this closet as a pantry and today I’ll show you how I did it and share all the tips I have to keep it organized! This is the closet that I turned into a pantry and just beside the two closet doors was another closet! 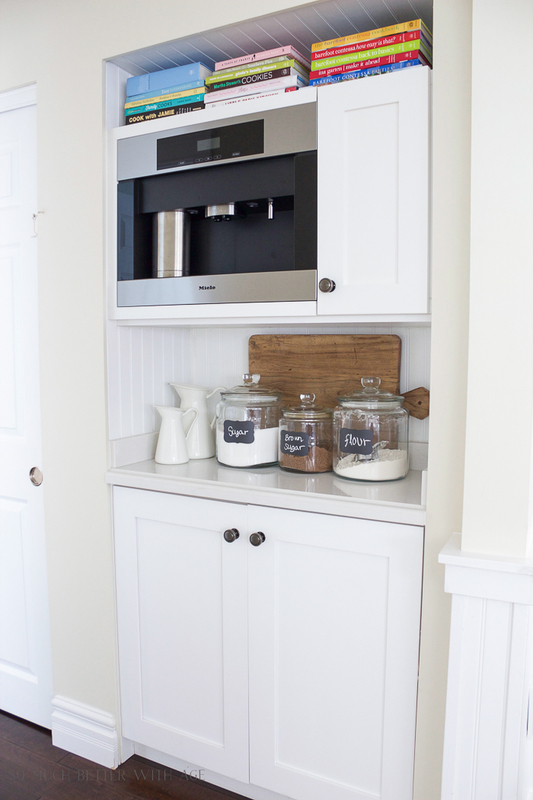 With so many closets, we turned one of them into a mini butler pantry/coffee station. To give you an idea of what I started with this, this is what my ‘pantry’ looked like before. Because this closet was so big, things just became messy over time and needed to be organized and STAY organized. 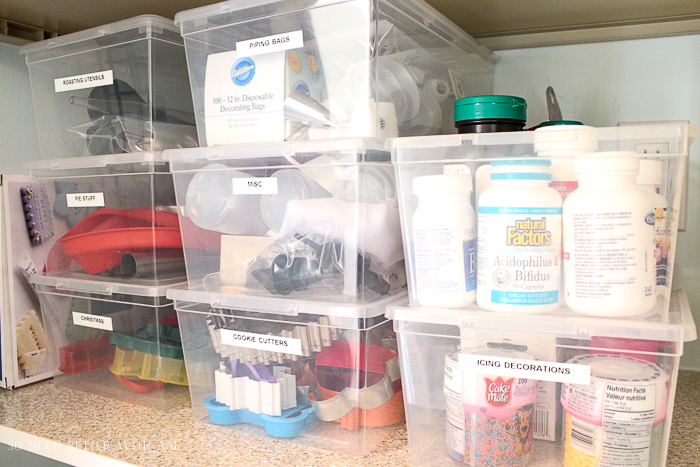 How I Organized My Closet Pantry with 14 Tips! I painted the inside of the closet with some leftover paint. I thought I might keep it in order more if the walls were pretty. It seems to have worked! 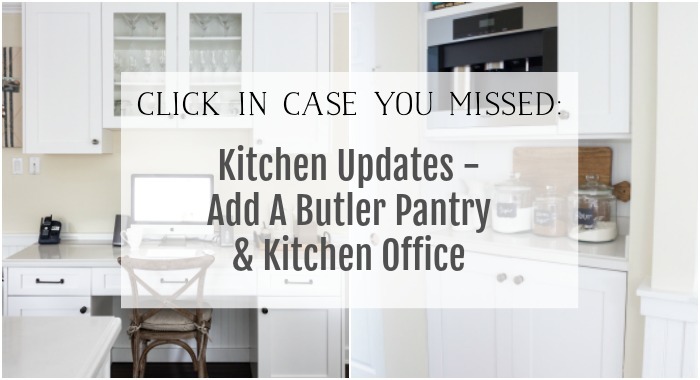 I took big, bulky appliances from the kitchen and stored them in this pantry as well which freed up more space in the kitchen for everyday items. I used a variety of different organizing items to keep things in their proper place. Using a hanging magazine/file folder holder was great for keeping garbage bags and diaper genie bags in place. This kitchen wrap organizer is perfect for holding plastic wrap and bags. These are my favorite for so many things around the house! Group like items together (like roasting utensils, cookie cutters) and label them in their own plastic box. They are easy to stack and easy to see inside. 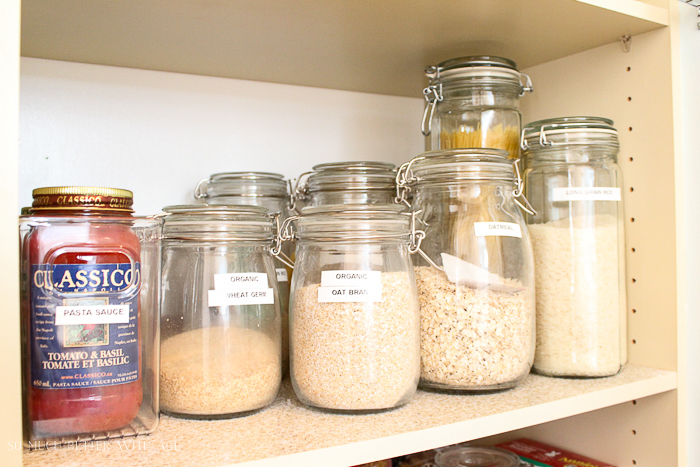 Have a section for different baking items and dried pasta labelled in glass sealed canisters. I also keep a container to keep all the pasta sauces together. I hate when bottles of oils drip onto the shelves. Keep everything clean and in order by grouping these items together and putting them in a clear plastic container like the clear shoe box. I keep my all-purpose flour, sugar, chocolate chips and cornmeal in these sealed plastic canisters as they are used most often in our house. Soup can dispensers are such a space saver. 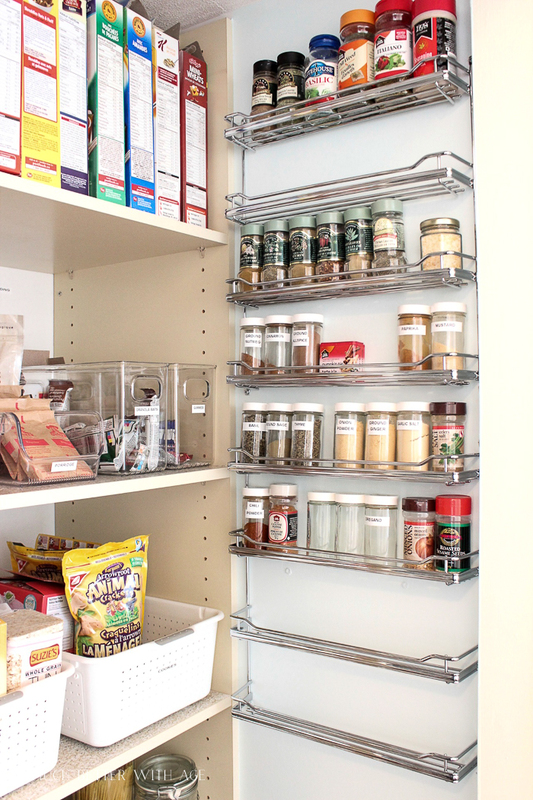 Using vertical space is so important in a pantry. Stacking shelving units are great for adding more vertical space and holding smaller items. 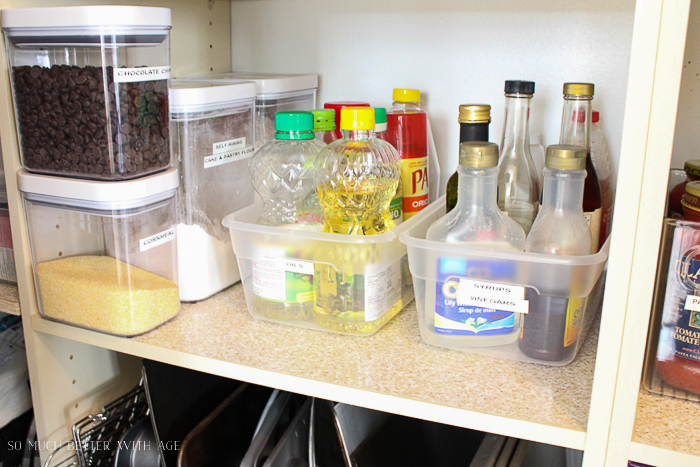 If you have taco seasoning packets and spice bags, divided organizers are great for holding them. 11. Add tray dividers to hold all your baking sheets upright. Do you see all those baking sheets near the bottom? Tray dividers are an inexpensive and great use of the vertical space. Keep porridge packs and granola bars in handy organizers and kids can grab them easily. 13. 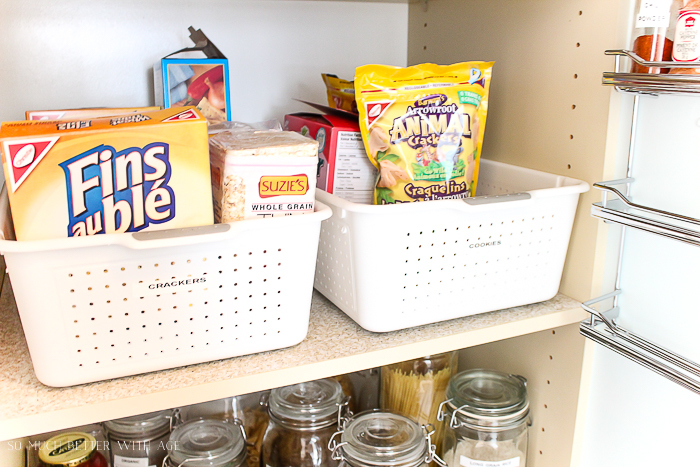 Use larger baskets and containers to hold group bigger items. Corral boxed items together and label them. When you pull the basket out, it acts like a drawer. This is the greatest space saver of all time! 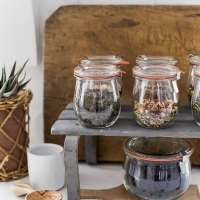 If you can put a wall hanging spice rack up like this, you’ll save so much space. 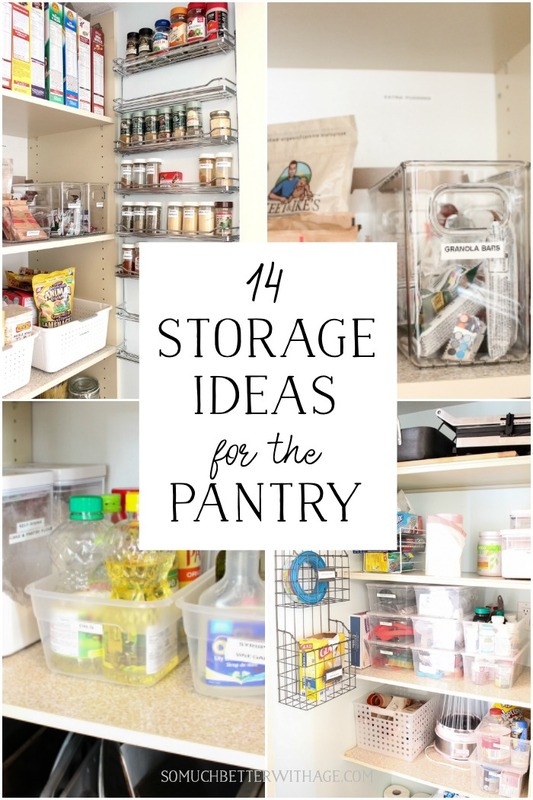 I hope this helps you to get your pantry organized and to maybe think of using a closet for your pantry if you have one. It’s awesome. Now, I feel like I want to sneak in your pantry and grab a snack while checking every details you did to make it look so organized. 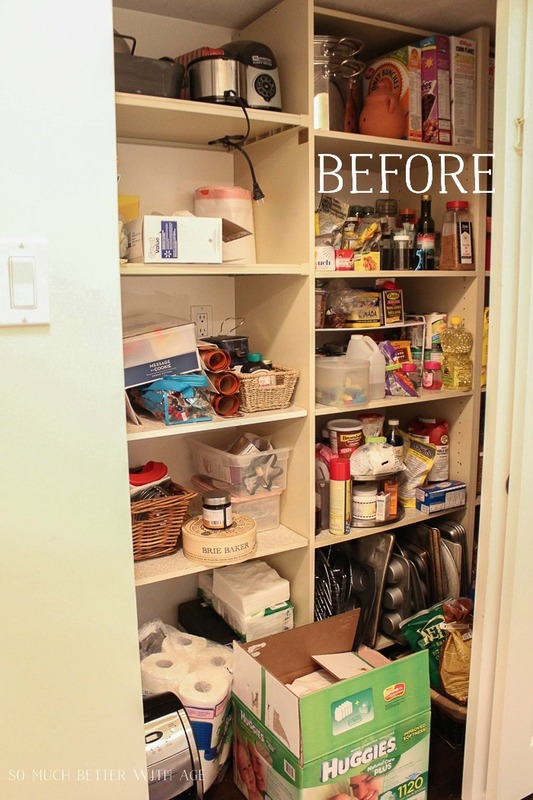 Great job reorganizing your pantry! I am always so happy and more productive when everything is organized. Isn’t it the best? This is so gorgeous! I am jealous of all your space! And you used every inch so well! Thanks so much for all the tips! 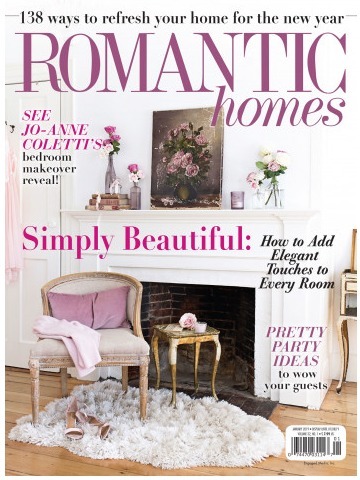 PS: I just adore your blog!! Looks so great thanks for all the good ideas. My husband always laughs at me and my label maker but I love it. Thanks Desiree! I actually requested that label maker for Christmas a few years back and hubby bought it for me. He thought I was joking. LOL. I love it! Wow! Great job! 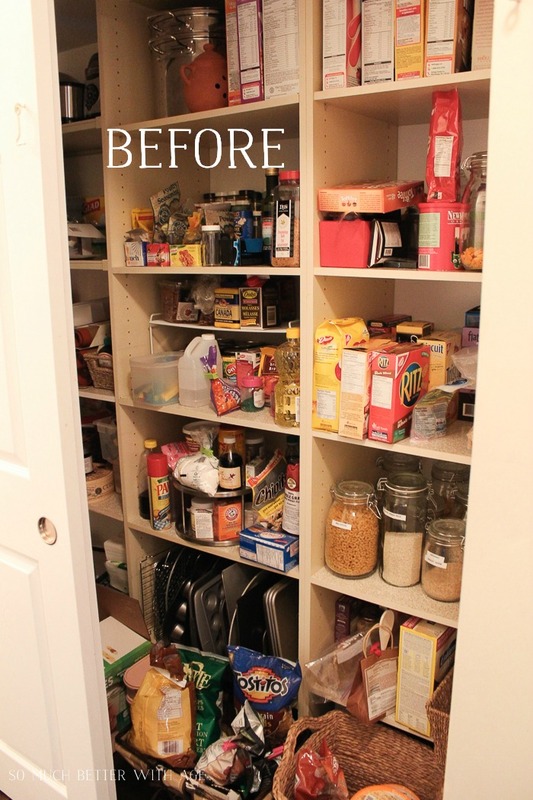 My pantry resembled this one a few months ago, but it seems to have gone back to its old ways again. Thanks for the inspiration to get it back on track! Thanks Jessica! It’s been like this for almost a month so I’m crossing my fingers it stays! i love the folder organizer. 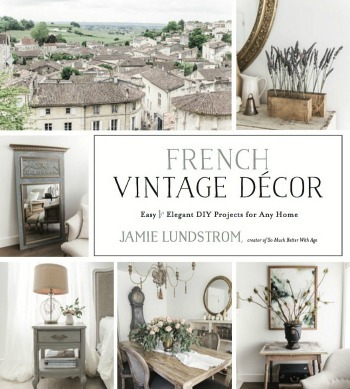 i need one for every room, i love how versatile they are! 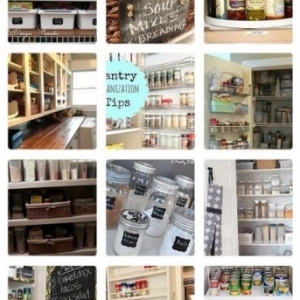 Love this pantry organization, Jamie! We have a similar pantry situation in our house. It’s a hall closet and we use it for overflow pantry items, linens, medicines & cleaning storage. I’m working on our guest bath & master bath right now to get some of the linen/medicine items moved into the bathrooms so that we can utilize some more of that pantry space. This is great inspiration! Wow, so happy for you! love the tips and all the ideas! Thanks for sharing! 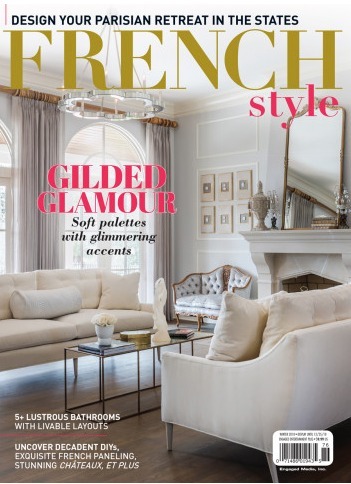 Oh, how I love an organized space! Great job!! 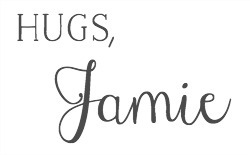 This is just wonderful, Jamie! You had some great tips, too! I have a pantry in my kitchen that is adequate, but you make me wish I had one of those long hallway-type closets. 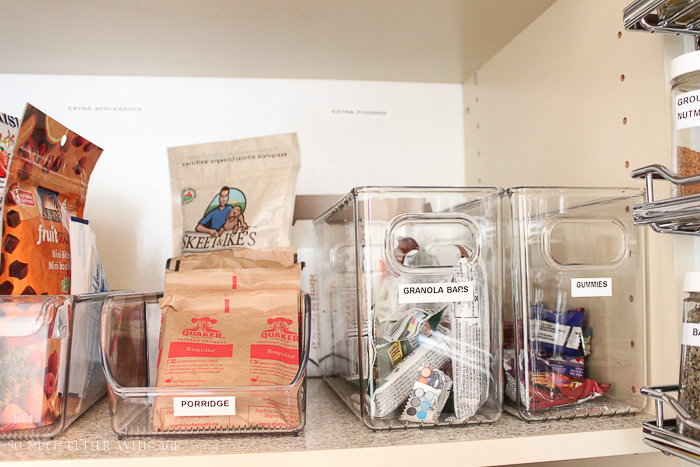 There is a benefit to a smaller pantry for us, I have to keep it pretty well organized. Always looking for the positive, that would be me….lol! Thanks for your comment, Carol! I have to laugh because I wish I had a smaller pantry closer to the kitchen LOL. Grass is always greener 😉 Have a great day! I’m happy to follow you along. Thanks so much, Pernilla! 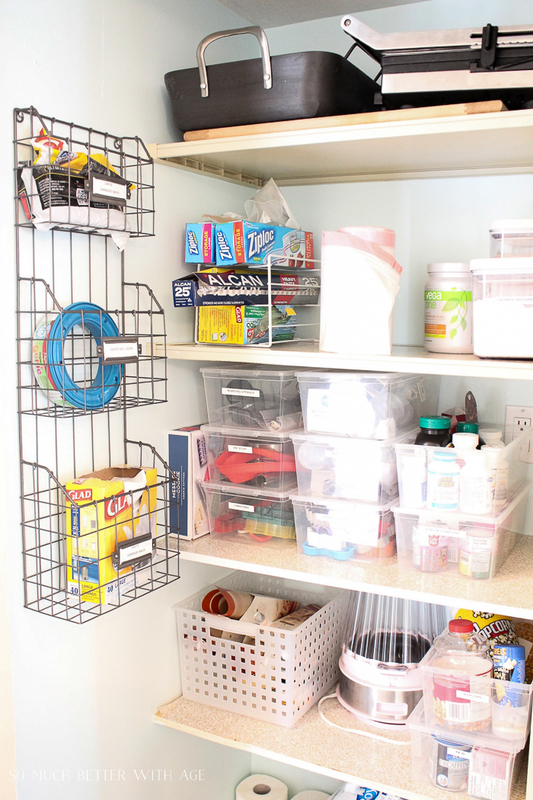 It’s hard to keep a pantry organized! Thanks Danielle. Enjoy the rest of your weekend. Now that is an amazing pantry! 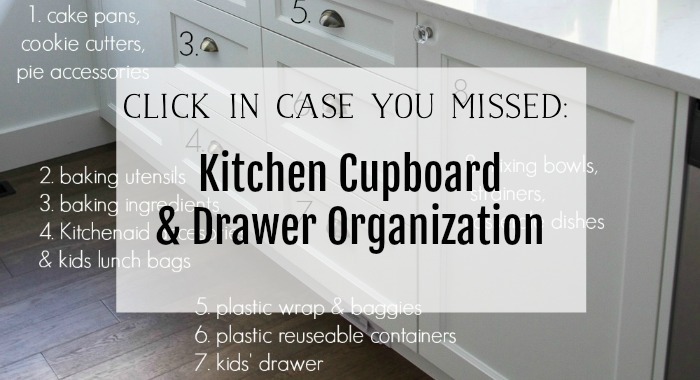 So many fabulous organization tips! Thanks so much for coming out to the party at Clean and Scentsible. I`ll be featuring this on my Facebook page. Have a great weekend! Wow, thank you so much Jenn! Fabulous tutorial Jamie! Thank you so much for sharing your new pantry with us at the Pretty Things party this week. Hope you can join me again tonight for another great party! Fabulous tips!!!!! Featuring later today. This is exactly what I’ve needed to see. I am so disgruntled every time I open my pantry! Where did you get that amazing spice rack?? 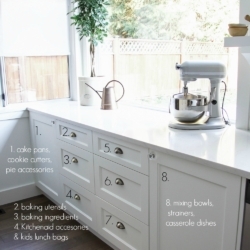 Awesome tips — love that spice rack! Awesome pantry! Thanks for all the tips, it all looks amazing! I love these ideas. Makes me want to organize a little more. I think most of these ideas are fantastic and very do-able. The only thing is that in one picture, it looks like you have things hanging on the inside of a cabinet door and if you were to close that door it would hit the things stored on the shelf.